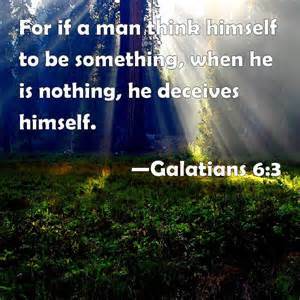 We have all seen it …….. someone who thinks they are something when in reality they are not, even we maybe have thought the same way before being saved and did not realize we were deceived. Whatsoever we sow in this life is also what we will reap. (Galatians 6:3-8). For if a man think himself to be something, when he is nothing, he deceiveth himself. But let every man prove his own work, and then shall he have rejoicing in himself alone, and not in another. For every man shall bear his own burden. Let him that is taught in the word communicate unto him that teacheth in all good things. Be not deceived; God is not mocked: for whatsoever a man soweth, that shall he also reap. For he that soweth to his flesh shall of the flesh reap corruption; but he that soweth to the Spirit shall of the Spirit reap life everlasting. Faith is a big part in receiving anything from the Lord, but if a person wavers and is doubtful they are as a driven wind over the water and tossed. One cannot be double-minded and expect good to come of it. (James 1:5-8). If any of you lack wisdom, let him ask of God, that giveth to all men liberally, and upbraideth not; and it shall be given him. But let him ask in faith, nothing wavering. For he that wavereth is like a wave of the sea driven with the wind and tossed. For let not that man think that he shall receive any thing of the Lord. A double minded man is unstable in all his ways. To the atheist and unbeliever there is nothing pure and they are not aware their conscience has been defiled. By a person’s works do they show how they think, for some claim to know God but by their works shown they deny Him. (Titus 1:15-16). Unto the pure all things are pure: but unto them that are defiled and unbelieving is nothing pure; but even their mind and conscience is defiled. They profess that they know God; but in works they deny him, being abominable, and disobedient, and unto every good work reprobate.